Slightly less than a week after this website was launched in July 2007, it got a Website of the Month Award! 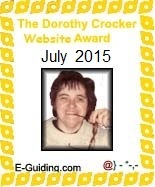 This award is presented to exceptional Guiding websites that aid Members of Guiding with resources to plan program, crafts, camps and other activities. They also provide links to other useful resources. Some Comments I've received about this website - thanks for the feedback!